The stars are not safe. That's what we learned from our hands-on impressions of Sid Meier's Civilization: Beyond Earth . But the stars, and their planets, are also filled with beautiful environments, just waiting for humanity to adapt or conquer. Seeing is believing, and we want to believe, so we put together this video of the sci-fi strategy game in action. 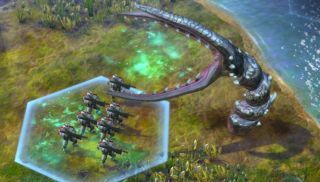 PC Gamer Managing Editor Cory Banks and MaximumPC.com's Tom McNamara talk about their impressions after playing 100 turns of Civ: Beyond Earth, including how it feels to get eaten by aliens and how Beyond Earth's interface is different from Civilization V .